The Rapture, Ancient Teaching or Recent Heresy? With the upcoming release of the first “Left Behind” movie, a lot of attention has been brought to a teaching that is largely peculiar to American evangelicalism, that is the doctrine of a pre-tribulation rapture. The basics of the teaching are that there will be a great tribulation that will fall on the whole earth, and that at the end of the tribulation Christ will return for the last judgement. Before the tribulation, however, Christ will also come and take away all true believers so that they don’t have to experience the tribulation. There have been numerous arguments brought forth against this teaching, but one of the more common in recent years is that the concept of a pre-tribulation rapture is a novel teaching, having largely been promulgated by John Darby in the 19th century, with some support from 17th and 18th century American evangelists. For non-Orthodox, I think the point of this argument is that if a pre-tribulation rapture was truly authentic, it would have been a common teaching earlier in history. I find this an interesting argument to see Protestants bring forth, as they pride themselves on being Sola Scriptura, and thus a new teaching doesn’t necessarily reflect an incorrect teaching. As long as it is established from Scripture, then it would be a valid teaching. I understand the argument from a Roman Catholic perspective, as they believe in the development of doctrine, and so a completely new teaching would be a bit troubling. The thing I find really surprising is to see Orthodox apologists trot out this argument. Orthodoxy is all about the teachings that have been handed down from Christ and the Apostles. In this regard, a new teaching would clearly not qualify. On the other hand, even if the teaching appeared much earlier in history, it would not become any more valid. Arianism is a pretty ancient teaching, but it is still a heresy. In response to this, adherents of the pre-trib rapture theory have endeavored a response on two levels. Both of these were posted by a friend of mine on Facebook, hence my response here. The first argument, which is a bit fallacious, is that a lack of known evidence that the doctrine was taught earlier in history is not sufficient proof that it wasn’t. This is sort of a special pleading. The burden of proof clearly lies with those arguing that the teaching did exist in history. It is virtually impossible to ever prove that something absolutely doesn’t exist. I can’t prove that the Loch Ness monster doesn’t exist, nor can I prove that ancient Greeks didn’t hold an annual festival in central Oklahoma. However, if I were to assert that either of those things are true, the burden would fall to me. “The days are coming when I draw near to visit the inhabitants of the earth, and when I require from the doers of iniquity the penalty of their iniquity, and when the humiliation of Zion is complete. When the seal is placed upon the age that is about to pass away, then I will show these signs: The books shall be opened before the face of the Firmament, and all shall see my judgment together. Children a year old shall speak with their voices, and pregnant women shall give birth to premature children at three or four months, and these shall live and leap about. Sown places still suddenly appear unsown, and full storehouses shall suddenly be found to be empty, the Trumpet shall sound aloud and when all hear it, they shall suddenly be terrified At that time friends will make war on friends like enemies, the earth and those who inhabit it shall be terrified. Then we have the tribulation period, then at the end when Jesus returns with us, as the armies of heaven : They shall see those who were taken up, who from their birth had not tasted death, and the heart of the earth’s inhabitants shall be changed and converted to a different spirit. For evil shall be blotted out and deceit shall be quenched, faithfulness shall flourish, and corruption shall be overcome, and the Truth, which has been so long without fruit, shall be revealed. Whosoever remaineth from all these that I have told thee shall escape, and see my salvation, and the end of your world. And the men that are received shall see it, who have not tasted death from their birth: and the heart of the inhabitants shall be changed, and turned into another meaning. Which implies that the men that are received are, in fact, those believers who came through the tribulation. It is their witness, in effect, that changes hearts. This interpretation is actually closer to the historic, Orthodox understanding that Christians will undergo the tribulation, and some will make it through the tribulation without losing their faith, but others will not be so fortunate. There is some discussion of people who escape tribulation, and we will discuss under what circumstances that happens a bit later on. The days are coming when the Most High will deliver those who are on the earth, And bewilderment of mind shall come over those who inhabit the earth. They shall plan to make war against one another, city against city, place against place, people against people, and Kingdom against Kingdom. When these things take place and the signs occur that I showed you before, then my Son will be revealed”. Behold, the days come, when the most High will begin to deliver them that are upon the earth. And he shall come to the astonishment of them that dwell on the earth. And one shall undertake to fight against another, one city against another, one place against another, one people against another, and one realm against another. And the time shall be when these things shall come to pass, and the signs shall happen which I shewed thee before, and then shall my Son be declared, whom thou sawest as a man ascending. Behold, the days are coming when the Most High will deliver those who are on the earth. And bewilderment of mind shall come over those who dwell on the earth. And they shall plan to make war against one another, city against city, place against place, people against people, and kingdom against kingdom. And when these things come to pass and the signs occur which I showed you before, then my Son will be revealed, whom you saw as a man coming up from the sea. I would be curious to see the underlying text (in Latin or Greek) from which this passage comes. I suspect that the man coming up from the sea may more appropriately refer to coming up from the depths or the grave. Regardless, does this speak of a pre-tribulation rapture? Nothing in this speaks to the rapture. We see that God will deliver (or begin to deliver depending on the translation) those who are on earth. This will happen at the second coming, so what in these passages point to a pre-tribulation rapture? “Listen, my elect ones, says the Lord, the days of tribulation are at hand, but I will deliver you from them. Do not fear or doubt, for God is your guide. You who keep my commandments and precepts, says the Lord God must not let your sins weigh you down or your iniquities prevail over you “. The other translations by and large agree with this one, but on the other hand there is nothing here that argues for a pre-tribulation rapture. Yes, being delivered from the days of tribulation could be used to support that teaching, but it hardly establishes that it was the teaching at the time. Further on, when I discuss the Orthodox understanding of the end times, I will explore what it means to be delivered from tribulation. Before leaving Esdras, I must highlight that the translations my friend posted for the first quote don’t compare well in that critical sections with the RSV or KJV. The translation, in fact, contains a line that sound almost like an insertion written by a pre-trib rapture proponent. This wouldn’t necessarily be a big deal except that as we are about to see, there appears to be a tendency among some groups supportive of the pre-tribulation rapture to simply manufacture evidence to support their position. The Dead Sea Scrolls have been a treasure house of insight into the religious environment of the holy land around the time of Christ. We have great evidence regarding the various manuscript traditions that would ultimately inform the various translations of the Bible that we have today. Given the amount of scholarship that has gone into the study of the Dead Sea Scrolls, they provide a tempting target for use to defend a certain belief. The first problem is that the Dead Sea Scrolls have all been catalogued. Typically, references to quotes within them include a reference to the cave and fragment associate with the quote. As I said previously, there has been a great deal of scholarship associated with the scrolls. The absence of any reference makes it impossible to study this quote in any manner. Attempting to find this scroll through online searches has only yielded one result. That this scroll doesn’t exist, and that it was fabricated by Jack Van Impe Ministries. The referenced scholar and theological school don’t appear to exist. It is sad that people resort to fabricating evidence to support their views. Between this, and the interesting modification to the Esdras text we saw above, I have to admit I have a greater than normal sense of skepticism regarding any claims by dispensationalists about the existence of evidence supporting their view. One other thing we must be on guard against is the reading back into ancient texts, modern notions. This is especially risky when one is fishing for the odd quote to support their position. I think we will see a bit of this in the following. Clothed, therefore, my brethren, with faith in the Lord and remembering the great things which He had taught me, I boldly faced the beast. Now that beast came on with such noise and force, that it could itself have destroyed a city. I came near it, and the monstrous beast stretched itself out on the ground, and showed nothing but its tongue, and did not stir at all until I had passed by it. Now the beast had four colours on its head— black, then fiery and bloody, then golden, and lastly white. Now after I had passed by the wild beast, and had moved forward about thirty feet, lo! A virgin meets me, adorned as if she were proceeding from the bridal chamber, clothed entirely in white, and with white sandals, and veiled up to her forehead, and her head was covered by a hood. And she had white hair. I knew from my former visions that this was the Church, and I became more joyful. She saluted me, and said, Hail, O man! And I returned her salutation, and said, Lady, hail! And she answered, and said to me, Has nothing crossed your path? I say, I was met by a beast of such a size that it could destroy peoples, but through the power of the Lord and His great mercy I escaped from it. Well did you escape from it, says she, because you cast your care on God, and opened your heart to the Lord, believing that you can be saved by no other than by His great and glorious name. On this account the Lord has sent His angel, who has rule over the beasts, and whose name is Thegri, and has shut up its mouth, so that it cannot tear you. You have escaped from great tribulation on account of your faith, and because you did not doubt in the presence of such a beast. Go, therefore, and tell the elect of the Lord His mighty deeds, and say to them that this beast is a type of the great tribulation that is coming. If then you prepare yourselves, and repent with all your heart, and turn to the Lord, it will be possible for you to escape it, if your heart be pure and spotless, and you spend the rest of the days of your life in serving the Lord blamelessly. Read in context, we see that God protects the Shepherd from tribulation by “shutting up the mouth” of the beast, not by removing the Shepherd. There are a couple of different ways to read this. One is that the Lord will literally not allow devout Christians to be harmed in the tribulation. The other is a more spiritual reading, that the devout Christian who does not doubt, even in the face of tribulation will not be spiritually harmed by it. I prefer this latter reading, because it is more consistent with what we know of the martyrdoms that were very common at the time this text was written, and it is more consistent with earlier portions of the Shepherd, that indicate that everyone can expect to undergo actual tribulation. So, the support from the Shepherd of Hermas really isn’t there when you read the text in context. In fact, the protection from tribulation here is much more similar to what we saw earlier in Esdras. Faithful Christians will not suffer spiritual damage. They will be protected from succumbing to the tribulation, not protected from undergoing it. (Update on November 14th, 2014): I was just listening to Fr. Andrew Stephen Damick delivering a talk on the Pre-Tribulation Rapture and he pointed out this line from Jesus’ high priestly prayer: “I do not pray that You should take them out of the world, but that You should keep them from the evil one.” So Jesus asks the Father to keep believers from tribulation, but not by removing them from this world. This is taken from his commentary on the Revelation of John, specifically the 15th chapter. The difficulty here is that this comment is somewhat vague. What is meant by the “church shall have gone out of the midst”. Does it mean they have been raptured away, or does it mean something more akin to the church having gone out of the midst of the sinners? Given his treatment of chapter 14, where he makes reference to the people mingling with the nations, followed by a discussion of certain nations being destroyed by God during the tribulation. Further, previously, he notes that the faithful will be gathered together in Judea, where they will “be supported there for three years and six months from the presence of the devil.” Whether Judea refers to Israel or the Bishop is referring to a more spiritual understanding is unclear to me from the limited reading I’ve been able to give this text, but there is nothing in his writing to indicate that he believes the Church will be physically taken away to heaven. Given that this notion of heaven and hell being separate physical places is a bit modern, it would be quite surprising if it were otherwise. The ancient Church has always taught, as laid out in the Bible, that Christians will undergo tribulation. Some will escape that fate, but it is because they died before those time. Further, when we see a phrase, such as the Church has gone out from the midst, this avails of multiple interpretations. One that comes to mind, especially in light of recent events, is that this is the time when the Church leaves its public place and goes back into hiding. So, why does it matter about the historicity of the teaching about the rapture? As I mentioned earlier, from an Orthodox perspective, that is not terribly relevant. It is that this teaching is not that which was handed down from Christ and the Apostles that is the issue. So, why am I particularly concerned with this, why would Orthodoxy be concerned with this teaching? The problem isn’t whether or not the teaching is historic, but whether it is correct. Because this isn’t a teaching we have received from the beginning, we would automatically suspect that it might not be correct. However, it is that it teaches things contrary that which we have received that should concern everyone, and it is in these contradictions that a real danger lies. The teaching of the pre-tribulation rapture opposes the Orthodox teaching in two key areas. One has to do with the “geography” of heaven and hell, as one Orthodox Priest has described it, and the other has to do with what could be regarded as an essentially fundamental aspect of being a Christian, that of suffering. From the geography perspective, the notion that Christ will come and take people away to heaven, as if it is a physically separate place. As addressed, both here, and even better, here, that notion is mistaken. It is, in fact, a somewhat modern idea. It is a basic Christian teaching that God is present everywhere. The concept for this is see within the Psalms and elsewhere. 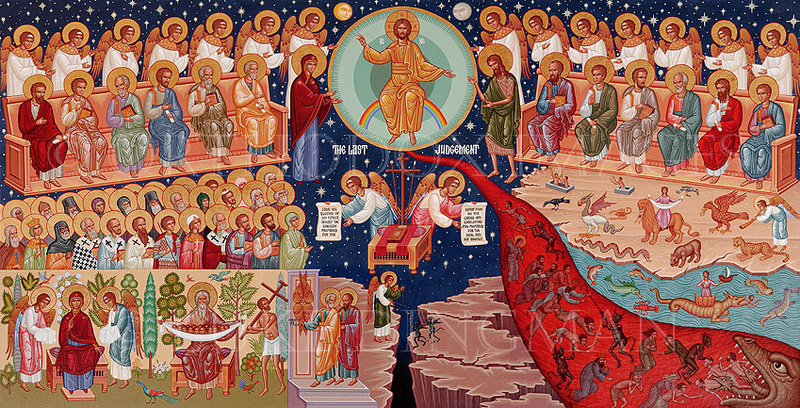 Within the Orthodox Church, we say a prayer at almost every service that starts with “O God, who is everywhere present and sees all things.” If God is truly everywhere present, where exactly would Heaven be, if not everywhere? The fact that we do not perceive heaven, in fact, speaks to our state, not to God’s. The experience of heaven and hell, then, has much more to do with our spiritual state, and not with geography. In a talk to an Orthodox youth group, one Orthodox theologian points out that the river of fire, and the pain it causes the unrighteous, is, in reality, God’s grace. To the righteous, to those that have learned to love others and God before themselves, this grace will be light and warmth. To the the unrighteous, to those who love themselves above others, this grace, this essentially pure love, will be painful. I’m giving the full teaching short shrift, so I would recommend reading the linked articles to fully get the nuance involved here. I will say, to wrap this up, that it is well known among the Orthodox that there is much more around us that we do not routinely perceive, but are occasionally given glimpses of. Many stories exist, frequently of adults, but much more often involving young children, that describe them seeing things around us that those of us who’s vision has been darkened by our sins cannot see. From saints and angels to priests surrounded by fire during the liturgy, to my own daughter who, when very young simply let out a big “wow” at a very holy moment in the liturgy (we’ll never know what she saw), there is an ever present reality of heaven that we simply don’t get. We see through a glass, darkly, is how the Apostle puts it. Some day – after the second coming – we’ll see clearly. The pre-trib rapture theory seems to imply that none of this is true. That God exists somewhere up on the second story of our universe, which is where we’ll go if we behave ourselves. If we follow the rules. There seems to be little in the theory that speaks to our experience of God Himself. Frankly, it all feels rather hollow. The other problem is, in many ways related. The theory, developed during a time when Christianity was the law of the land, implies that somehow Christians won’t need to suffer. It was promulgated largely by people who had never really experienced persecution, and who seemed blissfully ignorant of the real history of Christianity. As noted earlier, when we read documents such as the Shepherd of Hermas, who states, in part, “Happy you who endure the great tribulation that is coming on,” is writing in a time when Christians were subjected to torture and death frequently. Christians knew that there was, in fact, benefit to this suffering, that it helps purify us. Refines us as if by fire. When we look at the the prototype of prototypes, Christ, we see that our salvation is realized through His suffering. When we look at the the Protomartyr Stephen, we see that he has a vision of heaven as he is being stoned. He isn’t angry or scared. He doesn’t curse his persecutors. No, God protects him from the tribulation, not by removing him from it, but by being strengthening him, which is really the promise we find in the ancient writings quoted. Those who propose that good Christians will never experience a great tribulation, are not only historically ignorant, but ignorant of current events. Some of that ignorance is self imposed, because it threatens their world view, such as the fact that Christians have been persecuted by the state of Israel for years. The rest is because the U.S. media is largely uninterested in reporting things, such as the fact that Christians have been driven out of Nineveh for the first time in 2000 years, and that children are beheaded because they are Christian. Denying ourselves is a key component of our growth as Christians. It is why Christians have always practiced things such as fasting. It is a very small taste of suffering that helps us learn to put others ahead of ourselves, to love others, to be more conformed to Christ. To propose that suffering is somehow something that God will not allow us to endure is not only unbiblical, it is outright spiritually dangerous. Of course, many Christians will never experience true tribulation, but the problem here is the assertion that somehow all Christians will be removed from it at some point in time. To close, I will need to add one more aspect of the pre-tribulation rapture related to this escape from suffering concept that I find, at the very least, to be a sad thing to witness. The people I know who are very heavily into this teaching seem to focus on the notion that the coming tribulation is bad, and if you want to escape it you should become a Christian. While warnings of dire consequences to the lapsed are hardly unknown biblically, this does not sound much like the Gospel. Where did Christ say that he was coming so that individuals could escape suffering? When did Christianity become all about punishment and reward? The Gospel message of the pre-tribulation rapture is that you better become a Christian or else you will suffer. The message of the Gospel is that you will become a Christian and suffer, but you should fear not. “And fear not them which kill the body, but are not able to kill the soul.” (Matthew 10:28). According to Blessed Theophylact, “Those who slay accomplish the destruction of only the body, while they are perhaps the benefactors of the soul.” Christianity is about having life, and having it abundantly, not about avoiding pain and suffering. It is about being united to Christ, not avoiding punishment. When we turn Christianity into something entirely about punishment and reward then we turn it into another religion. Love isn’t about punishment and reward. As Orthodox, we understand that while we strive to become more righteous there is nothing that we do which merits a reward. While those who adhere to a belief in a pre-tribulation rapture claim to believe this as well, their views about the rapture seem to indicate otherwise.